Get your Arduino moving! This shield makes it easy to control two high-power DC motors with your Arduino or Arduino-compatible board. Its dual robust VNH5019 motor drivers operate from 5.5 to 24 V and can deliver a continuous 12 A (30 A peak) per motor, or a continuous 24 A (60 A peak) to a single motor connected to both channels. These great drivers also offer current-sense feedback and accept ultrasonic PWM frequencies for quieter operation. The Arduino pin mappings can all be customized if the defaults are not convenient, and the motor driver control lines are broken out along the left side of the shield for general-purpose use without an Arduino. 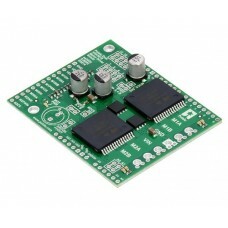 Pololu dual VNH5019 motor driver shield for Arduino. This motor driver shield and its corresponding Arduino library make it easy to control two bidirectional, high-power, brushed DC motors with an Arduino or compatible board, such as the A-Star 32U4 Prime. The board features a pair of robust VNH5019 motor drivers from ST, which operate from 5.5 to 24 V and can deliver a continuous 12 A (30 A peak) per channel, and incorporates most of the components of the typical application diagram on page 14 of the VNH5019 datasheet (475k pdf), including pull-up and protection resistors and FETs for reverse battery protection. It ships fully populated with its SMD components, including the two VNH5019 ICs, as shown in the picture to the right; stackable Arduino headers and terminal blocks for connecting motors and motor power are included but are not soldered in (see the Included Hardware section below). 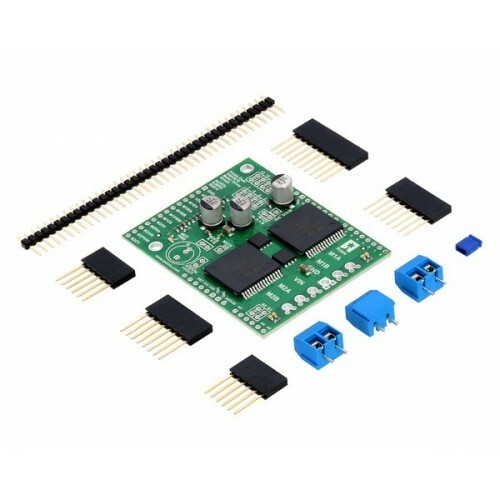 This versatile motor driver is intended for a wide range of users, from beginners who just want a plug-and-play motor control solution for their Arduinos (and are okay with a little soldering) to experts who want to directly interface with ST’s great motor driver ICs. The Arduino pin mappings can all be customized if the defaults are not convenient, and the VNH5019 control lines are broken out along the left side of the board for general-purpose use without an Arduino (see the right connection diagram below). 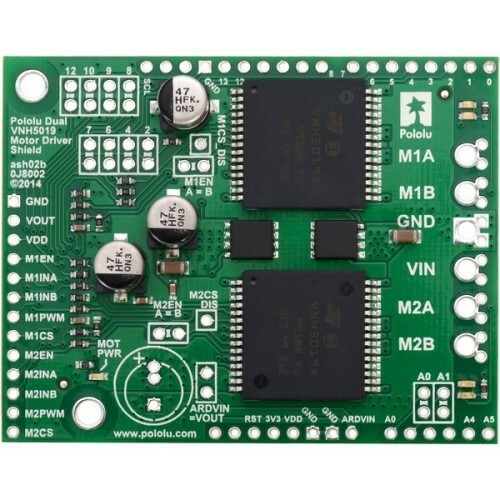 This versatility, along with an option to power the Arduino directly from the shield, sets this board apart from similar competing motor shields. Dual VNH5019 motor driver shield with an Arduino (shield and Arduino powered separately). Pololu dual VNH5019 motor driver shield, assembled and connected to an Arduino Uno R3. Pololu dual VNH5019 motor driver shield for Arduino, bottom view with board dimensions. Pololu dual VNH5019 motor driver shield for Arduino with included hardware. A 0.1" shorting block (for optionally supplying shield power to Arduino) is also included. You can solder the terminal blocks to the six large through-holes to make your motor and motor power connections, or you can break off a 12×1 section of the 0.1″ header strip and solder it into the smaller through-holes that border these larger holes. Note, however, that the terminal blocks are only rated for 16 A, and each header pin pair is only rated for a combined 6 A, so for higher-power applications, thick wires should be soldered directly to the board. The motor driver includes three 47 uF electrolytic power capacitors, and there is room to add additional capacitors (e.g. to compensate for long power wires or increase stability of the power supply). Additional power capacitors are usually not necessary, and no additional capacitors are included with this motor driver. The two mounting holes are intended for use with #4 screws (not included). They have a horizontal separation of 0.30″ and a vertical separation of 1.70″. An Arduino is not included. Schematic diagram of the Pololu dual VNH5019 motor driver shield for Arduino. 2. Not recommended for use with 24V batteries. 3. To -16 V. Connecting supplies over 16 V in reverse can damage the motor driver.